Sunday, April 21, 2019 11am - Homily by Dcn. Nick Nicki on "His Resurrection and Eternal Life is Our Certainty." Saturday, April 20, 2019, 9:00 pm - The New Fire was lit as we celebrated the Rising of Christ. Twenty Two new Catholics were baptized, received Confirmation and Eucharist and were welcomed into the Catholic Church. - Due to an equipment failure, no homily was recorded. 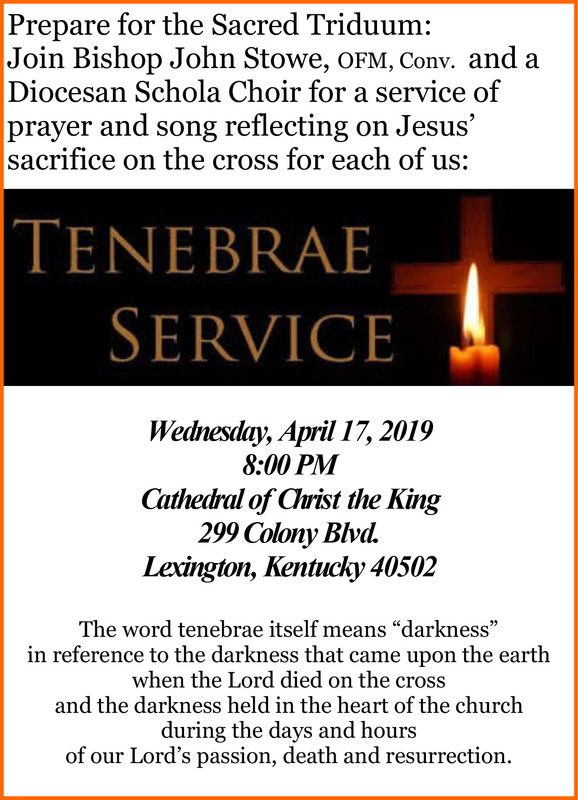 Friday, April 18, 2019, 7:00pm Liturgy - Fr. Vitner Martinez on "He was Crucified"
Thursday, April 17, 2019, 7:00pm Mass - Homily by Fr. Dan Noll on "Dying & Rising"
Saturday, April 13, 2019 4:00 PM Mass - Homily by Fr. Dan Noll on "Lay down our life in love"
Sunday, April 7, 2019 11:00am Mass - Homily by Rev. Dan Noll on "Jesus comes to give life out of death." Sunday, March 31, 2019 11:00am Mass - Homily by Dec. Larry Cranfill on "The Currency of Generosity." Saturday, March 23, 2019, 4:00 PM Mass - Homily by Dec Bill Rood on "Our time to change is limited"
Sunday, March 17, 2019 8:15am Mass - Homily by Rev. Dan Noll on "We are all walking around shining like the sun." Sunday, March 10. 2019 11:00am Mass - Homily by Rev. Dan Noll on "How Do We Get to Where We Want to Be?" Wednesday, March 6, 2019 8:15am Mass - Homily by Deacon Bill Rood "Thanks for snowflakes, and keeping Lent"
Do you know someone who may be considering the return to the Catholic Faith. A series of programs designed specially for them is planned beginning April 22, 2019. March 17, 2019, Christ the King Hehman Hall, following the 11:15am Mass with your favorite Irish foods - sponsored by the Lexington Ancient Order of Hibernians, Pearse Lyons Division. Saturday March 3, 2019 4:00 PM Homily by Fr. Vitner Martinez on "Open your eyes through Christ"
Saturday February 23, 2019 4:00 PM Homily by Fr. Carlos Martinez on "Loving your enemies."